Horace Brodzky (1885-1969) was a student at the School of the National Gallery of Victoria in Melbourne, but spent most of his creative life in London. He was one of the earliest Australian artists to embrace the modern style of the twentieth century. 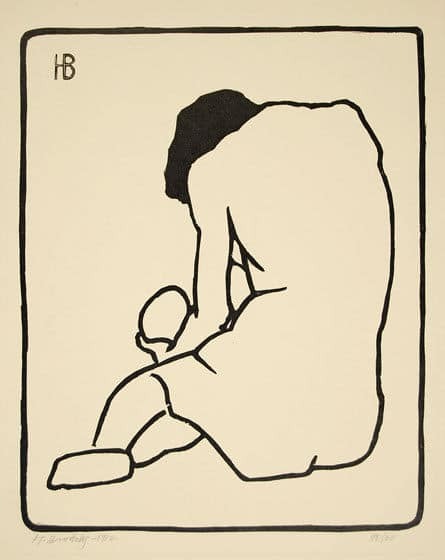 Brodzky was the first Australian to be exhibited at the Venice Biennale (1912) and the one of the first artists to experiment with lino-cutting. His graphics were used to illustrated the literary works of Ezra Pound, Eugene O’Neill, Upton Sinclair and Theodore Dreisler. Brodzky’s work is represented in such important collections as the British Museum, the Tate gallery, the Victoria and Albert Museum, the National Museum of Wales, the Arts Council of Great Britain, the Museum of Modern Art in New York, the Tel Aviv Museum, the Australian National Gallery of Victoria. Horace Brodzky was a student at the School of the National Gallery of Victoria in Melbourne. He was one of the earliest Australian artists to embrace the modern style of the twentieth century. He was the first Australian to be exhibited at the Venice Biennale in 1912 and the fourth recorded artist to experiment with lino-cutting, being the first to seriously involve himself in this medium. He was a member of the London Group and was the intimate friend of shuch well known artists and Henri Gaudier-brzeska, Jules Pascin, Hacob Epstein and David Bomberg. His graphics were used to illustrated the literary works of Ezra Pound, Eugene O’Neill, Upton Sinclair and Theodore Dreisler. He excels as a draughtsman of the female figure. His line is that exquisite blend of emotion and control, of tremulous feeling and master of technique that only the finest artist can command. Exhibited widely in Australia and overseas including many group and solo shows in London where he lived from 1923 until his death. Horace Brodsky-Retrospective Exhibition, Catalog, 1988.